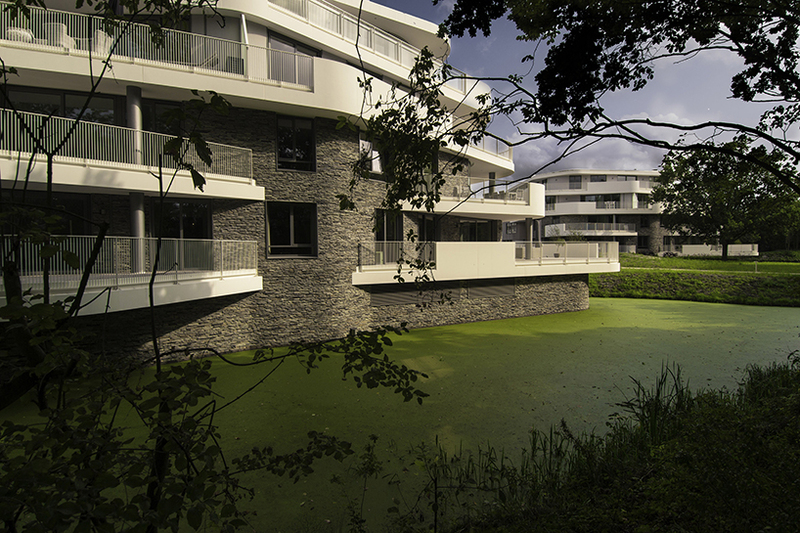 within walking distance to the center of the north dutch village of bergen, estate ‘de haaf’ was completed in september 2017. reinald bosman and bruce kee of BREIN architects have designed this striking project consisting of three organically planned apartment villas surrounded by a collective garden. in addition, they were co-initiators and key players in the sales process of the apartments. a great example of a new and expanding role as an architect, which, in spite of the real estate crisis, has enabled this project to be realized and be referred to as a success in all aspects. 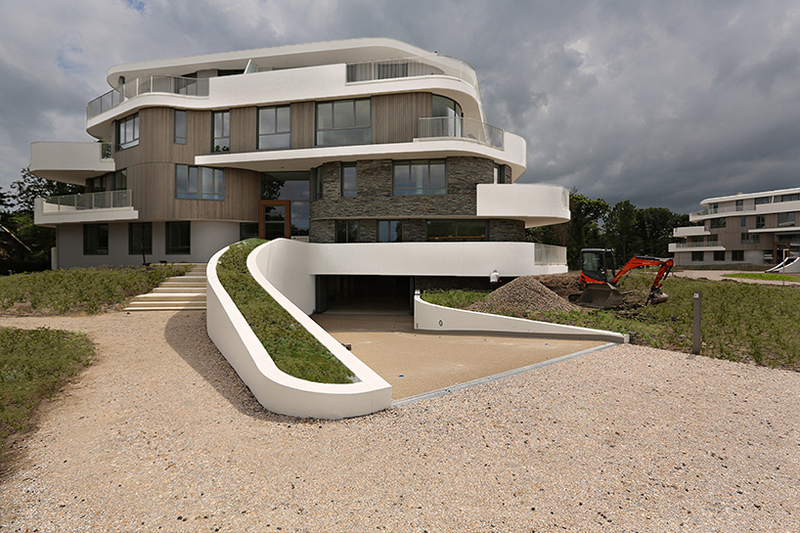 the basis for the main organic form of dutch based studio BREIN architects‘ villas has arisen from the urban planning concept. maximum experience from the apartment buildings and the neighborhood was essential, so there are no standard gardens between rectangular buildings but organic objects in a park-like setting. 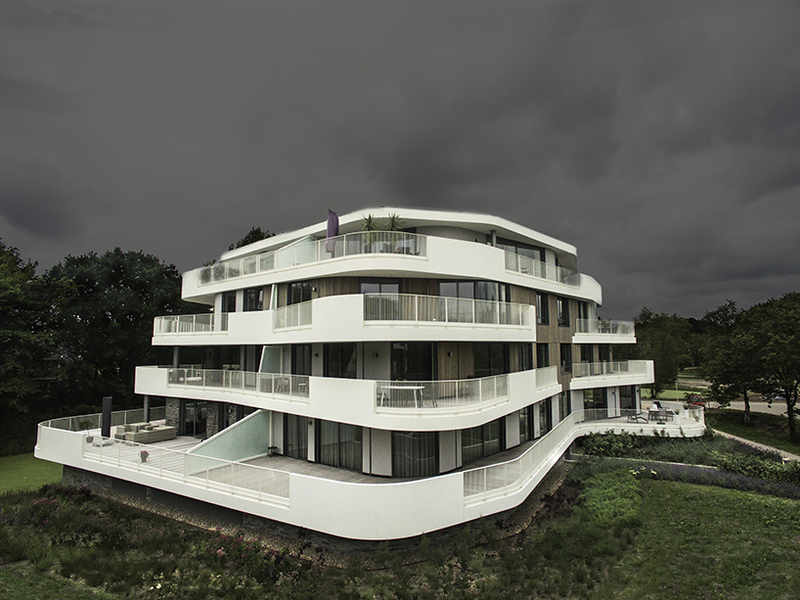 the requirement to offer each apartment optimal conditions in terms of layout, daylight exposure, privacy and view has determined the three-building’s shape. 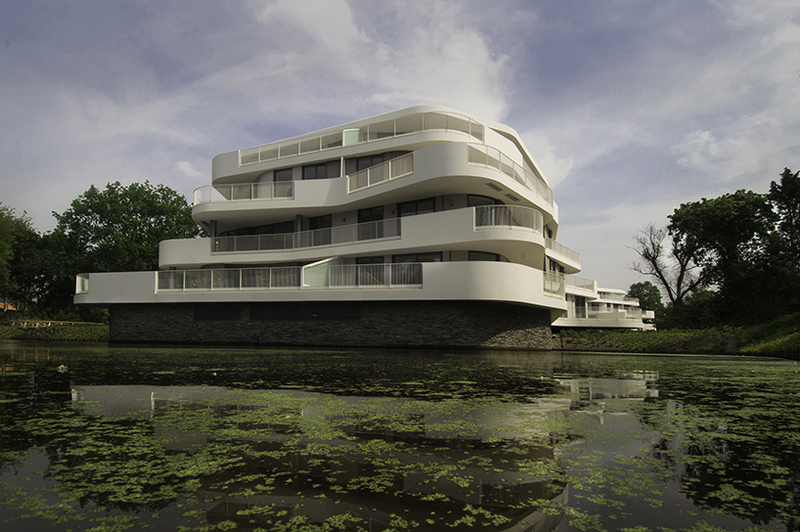 due to these flowing shapes, the buildings are not experienced as being built up of different building blocks, but as spatial masses that slowly transform when one moves alongside them, continuously providing a completely new and unexpected perspective. 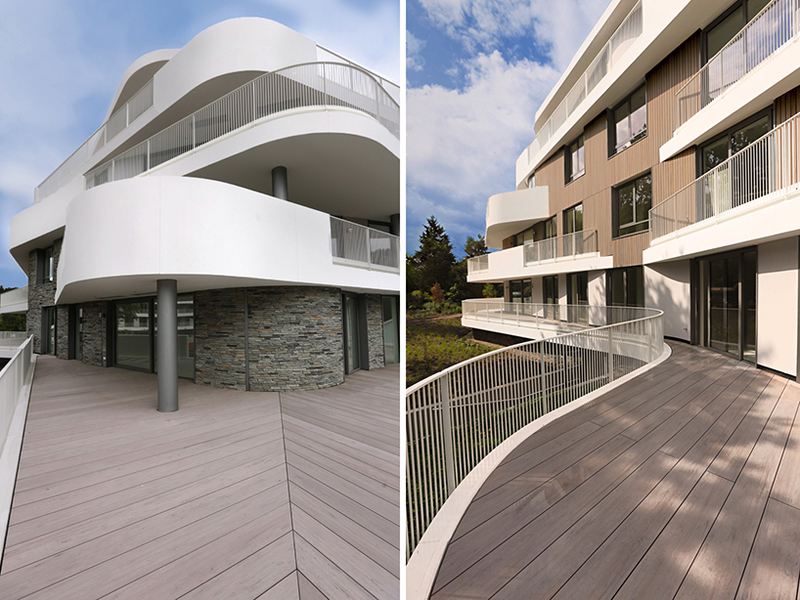 various natural materials are used in addition to glass and smooth white plaster — greying light wood, raw sandstone cement plaster and warm mixed concrete stones with a natural stone appearance. 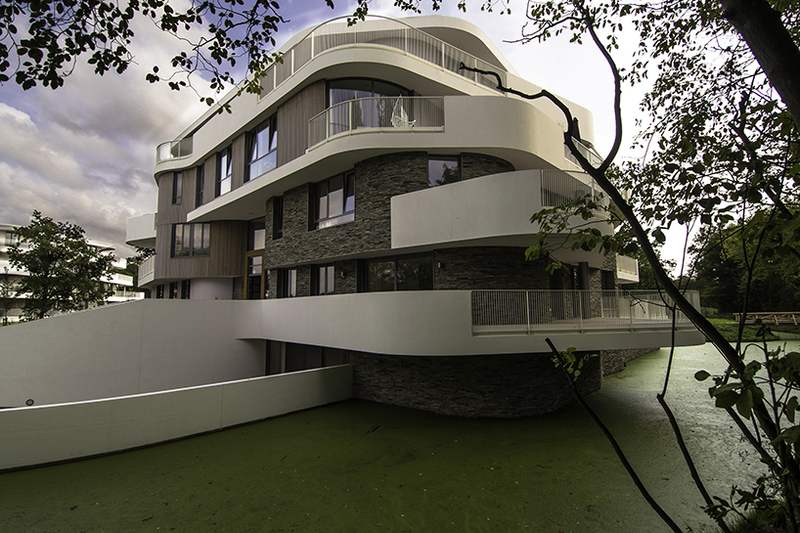 the architecture of ‘de haaf’ can be characterized as expressive, organic and sustainable and therefore fits in with the character of this special artistic village. where the ‘de haaf’ has always been an inaccessible private area, now it is a natural garden that is accessible for the public by day. the two-acre terrain has been transformed into a gently sloping dune landscape, with as natural character as possible, sand-colored paths and a sizeable pond, which functions as a rainwater buffer. the trees around it form the decor, and the garden consists of a wide variety of grasses, flowers, bushes and trees, which will provide a different experience at any time of the year. 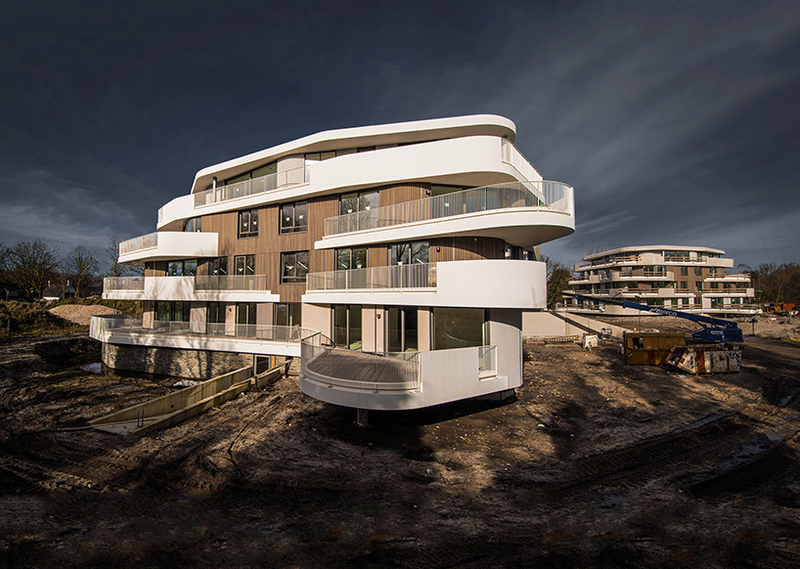 the built program of BREIN architects’ latest residential project ultimately covers three villas of four floors with a total of 41 different apartments with sizes ranging from 120 to 350 m2 including terraces between 25 and 140 m2. all storage facilities and the 60 parking spaces, are located in the sunken basements. 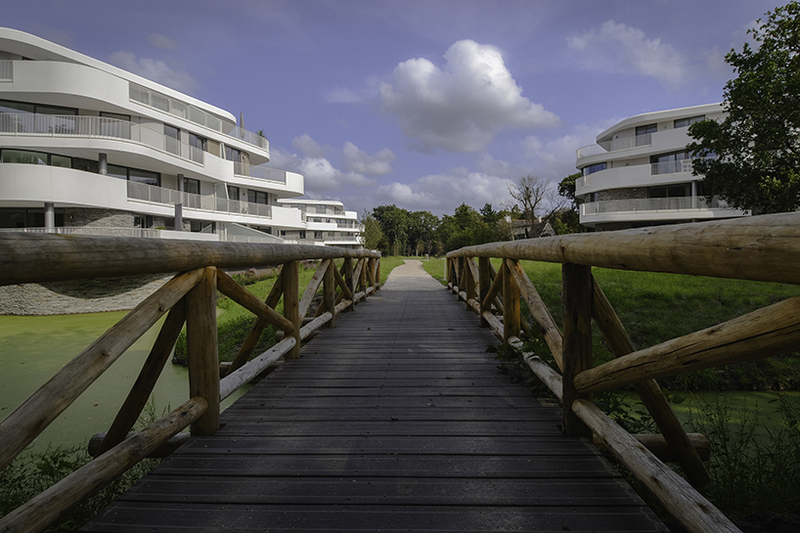 due to the constructive design, with a 6.6-square meter grid, and with a concrete floor seamlessly connected with the terraces, the layout of the apartments was largely flexible. this gave the future tenants the choice of spatial arrangement and even the placement of the facade, of course within the predetermined rules. 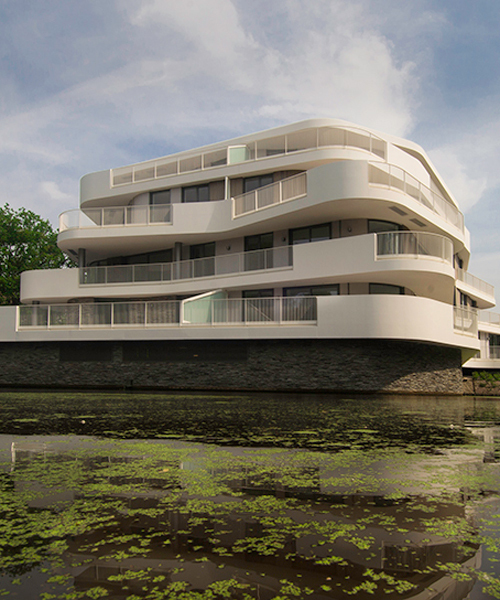 this way the apartments could be optimized for the individual buyers. the apartments are fully life-cycle proof and all facilities for home robotics, solar panels, sunscreens, terrace heating, alarm system and air conditioning are available. 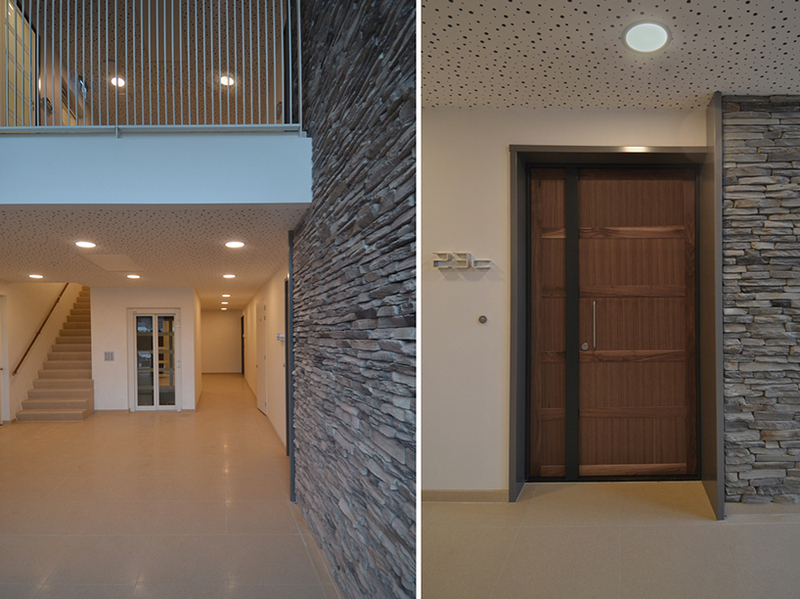 the main entrance has a double height and therefore plenty of natural light, providing a luxurious and welcoming entry for residents and visitors. because the basement garage, for many inhabitants, forms an important entrance to their home, this is set up spaciously with as much daylight and fresh air as possible.